The Root Chakra is located at the base of your spine, and extending in a funnel shape down toward the Earth. It is your base energy center, connecting you to the physical world. 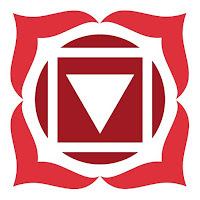 The traditional name for the root chakra is “Muladhara.” In yoga we use the “Mula Bandah” or Root Lock to connect the energy of the Earth up into the body. The Root Chakra is all about our relationship to the Earth, to our earthly life, the physical body and physical security and safety. Ways to support your Root Chakra are by eating root vegetables (if they are healthy to be in your diet), drink barley tea, take probiotics (live are best), and take a slow meander outside, preferably barefoot in the grass if possible! To connect to your Root Chakra, sit in silence and visualize a bright, brilliant red color at the base of your spine, right around the perineum. You might even extend your Root Chakra into the Earth and connect to the center of our Home. Symptoms of a malfunctioning Root Chakra are feeling spacey or out of it, not grounded, not present, in anxiety or fearful of the future, not trusting that you will receive what you need when you need it. The Sacral Chakra is located between the hips, extends in a funnel-shape forward and a funnel-shape backward. It is your relationship energy center, connecting you to others and your creativity. The Solar Plexus Chakra is located 2 finger-widths above your navel, extends in a funnel-shape forward and a funnel-shape backward. It is the center of your relationship to your self and self-esteem. The Heart Chakra is located in the center of your chest, extends in a funnel-shape forward and a funnel-shape backward. It is the center of your higher-functioning loving relationships and your relationship to all things. The Throat Chakra is located at your throat, extends in a funnel-shape forward and a funnel-shape backward. It is the area of Speaking your Truth and maintaining boundaries. 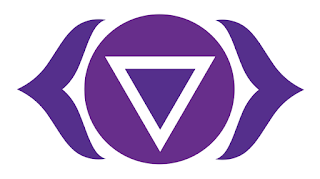 The Third Eye Chakra is located at a point between and just above your eyebrows, extends in a funnel-shape forward and a funnel-shape backward. It is the location of your inner world, visions and dreamscapes. The Crown Chakra is located at the very top of your head, extending in a funnel shape upward toward the Heavens. It concerns your relationship to higher beings like Angels, Guides and your Higher Self. 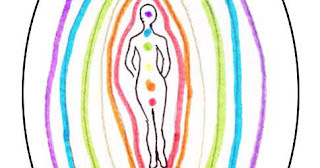 The Chakra System for the purposes of this course are the 7 major energy centers in the body. Each is located in an area that correlates to glands in the endocrine system and often major nerve centers. As we live we create relationship with different aspects of our experiences, externally and internally. The Chakras play a major role in our relationship-building. When the Chakras are blocked or malfunctioning, our perception and intake of energy will be skewed. Oftentimes we learn to live this way without knowing the experience of having a healthily-functioning Energy Body. The Energy Body consists of many layers, all connected to each other and includes the Chakras. 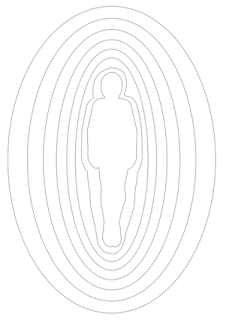 Our experience of life is experienced and filtered by our Energy Body. The Chakras are filters that connect, receive and move energy through the Energy Body as well as to all things around us. Our energy system is connected inherently to all things on this planet, seen and unseen as all matter is also energy. Each Chakra extends from the body in a Cone-like shape. The Crown and Root Chakras only extend from the body from top and bottom, while the other 5 Chakras extend forward and backward. Each chakra has it’s own dimensionality and corresponds to a layer in the Energy Field; Root Chakra being connected to the first layer and so on.